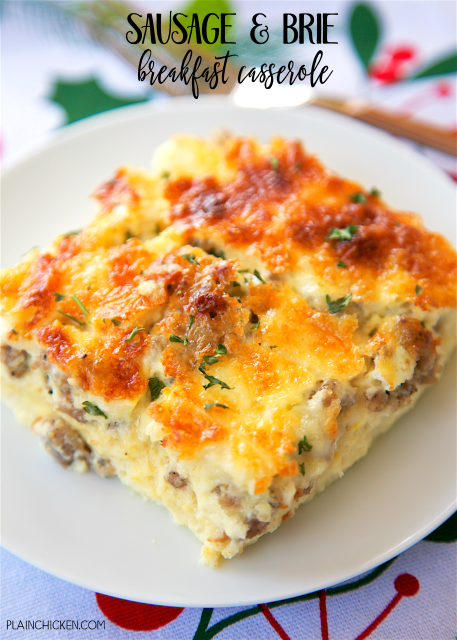 Sausage and Brie Breakfast Casserole - SO amazing! Make this the night before and bake in the morning. Sausage, brie, parmesan, white bread, eggs, whipping cream, milk, dry mustard, salt. This is our favorite breakfast casserole. A MUST for Christmas morning! This Sausage and Brie Breakfast Casserole might be my all-time favorite. I mean, how can you go wrong with baked sausage and creamy Brie? SO good!!! The best part of this casserole might just be that you can make it ahead of time and bake it on Christmas morning! Woohoo! I LOVE make ahead meals. This Sausage and Brie Breakfast Casserole gets it unique flavor from the brie cheese. It totally makes the casserole!! SO delicious. In addition to the brie, there is lots of yummy Parmesan cheese. Heaven! I used a roll of Tennessee Pride breakfast sausage for the sausage in the casserole. I also used just plain Sunbeam white bread for the bread. This casserole needs to refrigerate for 8 hours before baking, so it is perfect for Christmas morning! I think it is the perfect stress-free holiday breakfast! Trim rind from Brie. Cut cheese into cubes and set aside. Cook sausage in a large skillet until no longer pink, drain fat. Cut crust from bread slices and place in the bottom of a lightly greased 9x13-inch pan. Top with cooked sausage, brie cubes and grated Parmesan cheese. Whisk together 5 eggs, 2 cups whipping cream, milk, salt, pepper and dry mustard. Pour evenly over cheeses. Cover and refrigerate for 8 hours. Preheat oven to 350ºF. Remove casserole from refrigerator and uncover. Whisk together remaining 2 eggs and 1 cup of whipping cream. Pour over chilled casserole. Bake casserole uncovered for 1 hour, or until set. 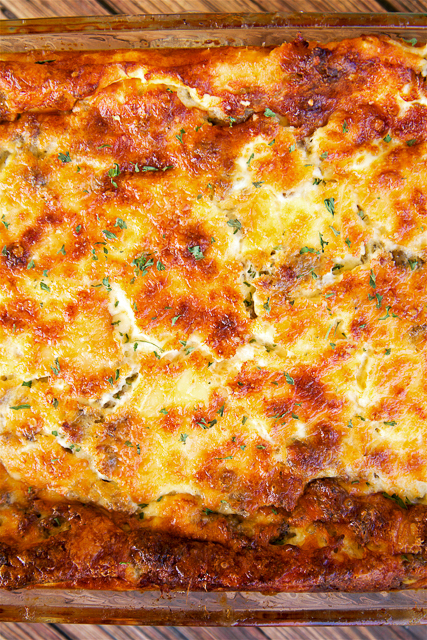 I love sausage, egg, and cheese casseroles and I can imagine the Brie making this one special. Sounds delish - but will this turn out right if I omit the bread? No no it won't. You need the bottom bread layer to hold together your breakfast casseroles, otherwise it'll turn more into a scramble. I'm sure there are some gluten free substitutes at your local health food store if that's your concern. what if I used shredded potato on the bottom instead of bread?